You will find us at 12 Southgate, Chichester, West Sussex PO19 1ES. If you are coming by train then walk north towards Southgate and you will find at next door to the barbers. By car there are a very large number of car parks dotted all round Chichester. 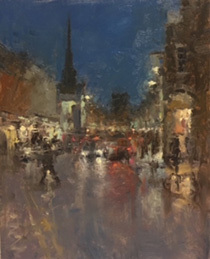 The two closest to the gallery are the large multi story on the left hand side of Avenue de Chartres, or a smaller one at the end of Deanery Close, which is the last left turning at the top of Avenue de Chartres just before the traffic lights.